Ford began production of the redesigned F-150 pickup at a second U.S. plant, in Kansas City, on Friday. DETROIT (Reuters) -- Ford Motor Co.'s launch of the redesigned, aluminum-intensive 2015 F-Series remains on track, and fleet customers will have their orders filled in greater numbers in the second quarter as production accelerates, a top executive said on Friday. With the F-Series, including the popular F-150, the top-selling vehicle in the United States and a key profit driver for the No. 2 U.S. automaker, analysts and investors have been watching closely the launch of the new model that began last fall. 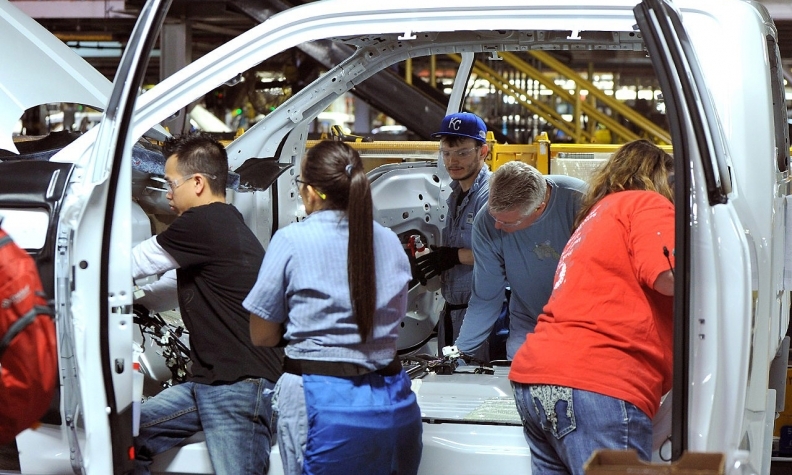 On Friday, Ford began production of the truck at a second U.S. plant, in Kansas City. "We are on schedule," Joe Hinrichs, Ford president of the Americas, told Reuters. "Everything is going to plan very nicely." He reaffirmed company statements that early production is being shipped to meet consumer demand and thus retail sales of the truck are up, while fleet sales are down. He said that spread would be more pronounced in the March U.S. sales results, and fleet customers would see more of their demand met in the second quarter.